Each year, the visitors to Concho Christmas Celebration's Tour of Lights are given Survey Cards at the entrance of the tour to fill out. These Survey Cards are then entered into the JCPenny/Sunset Mall $1,000 Shopping Spree. Click here for the Official Sweepstakes Rules. 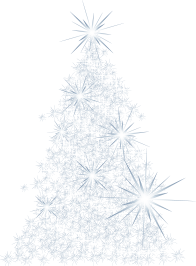 Click here to see the last year's winner of the Concho Christmas Celebration Survey Drawing. On Sunday, December 2nd, Bike Throught the Lights with Santa and take in the view of the three million Christmas lights and more than 75 Christmas Greeting Cards from atop your bike! This non-competitive ride, presented by Concho Christmas Celebration and the San Angelo Bicycling Association, is free and open to all. Parking is available at the San Angelo YMCA parking lot located at 353 S. Randolph. Santa, Mrs. Claus, and Elf John will be there between 4:30 pm and 5:15 p.m. The ride will begin at 5:30 p.m. and cyclists will exit at the lower YMCA parking lot at the corner of S. Randolph onto Veterans Memorial Drive. Cyclists will need front light, rear reflector or light and helmet. Cyclists must be off the streets of the Tour by 6:30 p.m. Contact Jason Pierce @ 479-225-1246 for more information. Santa and Mrs. Claus will have treats for the participants, and The San Angelo Bicycle Association will provide cookies and hot chocolate after the ride. Enjoy Christmas and holiday cartoons during the light tour. The animated feature is shown continuously on a large screen at the end of the Tour of Lights on Oakes Street, from December 1st through 31st. Park your car and bring your blankets! You are sure to make memories as you sit with your family and friends under the stars, sipping hot chocolate and watching classic cartoons. This year we will feature a favorite holiday favorite "PREP & LANDING." Closed captioning is featured on the Christmas cartoon/story selections. 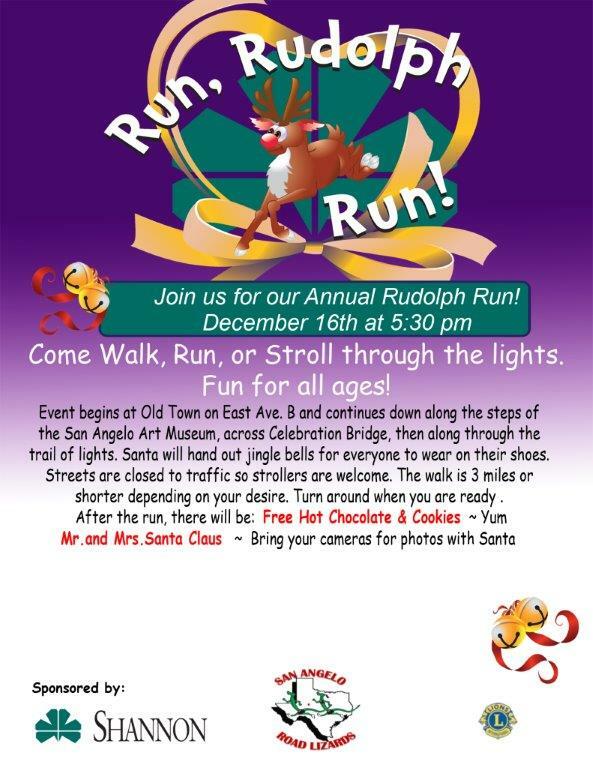 Run Rudolph Run will be held on Sunday, December 16th at 5:30 p.m. This year's event is hosted by the San Angelo Road Lizards and Shannon Medical Center. This is a free, non-competitive run/walk open to all. Join Santa and Mrs. Claus in running or walking the 2.5 miles through the Tour of Lights. Strollers and wheelchairs are welcome. Enjoy free hot chocolate and cookies. For more information, call Daniella De La Cerda at (325) 718-9270. This year's Tuba Christmas will be held on Saturday, December 8th at 12:00 noon at The San Angelo Museum of Fine Arts, located at 1 Love Street, San Angelo, Texas, along the beautiful Concho River. This event is free and open to the public. Plan to attend this unique and memorable concert event, featuring tuba and euphonium players from across the Concho Valley performing traditional Christmas and holiday songs. For more information, please call Eric Hansen at (325) 654-5383. New for 2018, the Kayaking Divas and Dudes annual holiday paddle will be one of Concho Christmas Celebration's featured events. "Kayak Through the Lights" will be held on Saturday, December 15th, beginning @ 5:30 p.m. at the boat ramp located behind the Girl Scouts Building, 304 W. Avenue A, San Angelo, Texas. Presented by the Kayaking Divas and Dudes, this event invites you to decorate your kayaks with festive Christmas lights and decorations and paddle the Concho River after dark. All kayaks must be illuminated to launch on the river. Texas Parks and Wildlife requires one "white" light mounted on the kayak, an oar, and a life vest must be worn. Bring your kayaks, lights and decorations and enjoy the FUN!!! Open the doors to a winter wonderland of holiday decorations at the Historic Railway Depot. Open December 21st 6:00-9:00 p.m., December 22nd 10:00-4:00 p.m. The kick-off event scheduled for Saturday, November 24, 2018. Santa Claus will arrive by train at 10:00 a.m. on the morning of December 1st. Admission is charged for this event. On December 22nd, Santa will be available for pictures from 6:00-9:00 p.m. Donations are accepted. For more information please call Roger Horton at (219) 718-9267.